Famous for its wonderful natural beauty, deep-rooted history, mild climate and brigth landascape, the island of Capri is a favourite destinations for international tourists.It is located seventeen nautical miles south of Naples and 3 from the Sorrento peninsula. It is about 6 Km. long and 1.2 to 2.8 km. 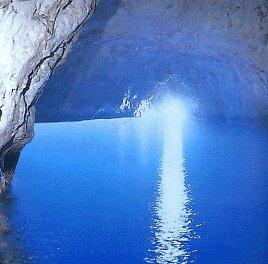 wide.Its covers an area of about 10 square km., 4 of which belong to the municipality of Capri and 6 to the municipality of Anacapri. The costal perimeter covers a distance of about 17 km. Mount Tiberio (334.) to the east and Mount Solaro (589 m.) to the west are the island's two main massifs, between which we find the small town of Capri (138 m.) straddling Marina Grande (to the north) and Marina Piccola (to the south). The other inhabited centre, Anacapri (286 m.), is located in a large verdant plain to the west of Mount Solaro. 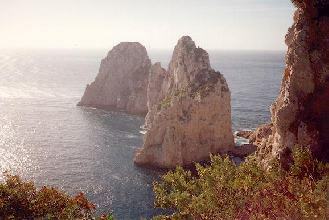 Contrary to other islands in the Gulf of Naples, Capri is of sedimentary, and not volcanic origin, having been formed by calcareous land dating to the Cretaceous period , and to a lesser degree by layers from the Eocene epoch and tufa carried by the wind from nearby volcanoes. From a geological angle, it representans the last sprus of the Sorrento peninsula mountain range which is also of calcareous origin. The flora one of the richiest in the whole of Italy, gives the island a lush appearance even during the cold season. Similary, the island's fauna , which includes a large number of marine species, enrich its deep waters; the land fauna also includes many non-migratory birds suchas the large albatrosses, and saurians, like the rare blue lizard of the Faraglioni. The naturally marine climate is temperature, plesant and salubrious. The average temperature is 13.1 ° C in the winter, 16.5 ° C in spring, 22.7 ° C in summer and 13.9° C in autumn.The etymology of the name " Capri" comes from the Latin " capraeae" (goats), not from the Greek "kapros" ( wild boar), even though numerous fossile remain of this animal have been found on the island.Inhabited since the Palaeolitic era, when it was joined to the mainland, the island was first Greek an later Roman. When Caesar Augustus visited it in 29 B.C., he was the first to build a villa here. Tiberius, his successor , lived here from 27 to 37 A.D.After Tiberius, other emperos stayed on Capri and until the 7th century A.D. it was visited and inhabited by Roman Empire, the island belonged for a time to the Duchy of Naples. In the 7th century it was raided by the Saracens and in the centuries that followed it was dominated by the Longobard, Normans, Anjouins; Aragonese and finally the Spanish: In the 18th and 19th centuries, the island came back into fashion, in unison with Naples' period of great political and artistic pride, thanks to an active diocese and the Spanish an later by the Bourbons.This is confirmed by the superb architecture of the churches and monasteries that can be admired in the two inhabited centres.From the mid-18th century onwards, the travellers who arrived with increasing frequency from northen parts, attracted by the sunshine and in search of a mithical primitive word, included Capri in their itineraries.From the mid-19th century onwards, following the "rediscovery" of the Blue Grotto, Italian and foreingn visitors flocked to the islands, attracted by the cimate, the inhabitants' hospitality and the colours and magnetic atmosphere of the places. A rtits, intellectuals, writers, exiles, eccentrics and wealthy visitors chose it as their permanents or seasonal recidense, contributing to from the highly varied cosmopolitan international colony that has made the name of Capri famous throughout the word.